Rocky is a 14 month old neutered male whose family lost their home. While they were staying with friends, Rocky opened the gate and went for an adventure. Animal Control picked him up, and his family couldn't afford the fees to get him released. He is a small boy who weighs about 40 lbs and needs to gain about 5 lbs...he wasn't very good at getting his share of the food! He is recovering from a head cold and will be ready to meet people in about 2 weeks. 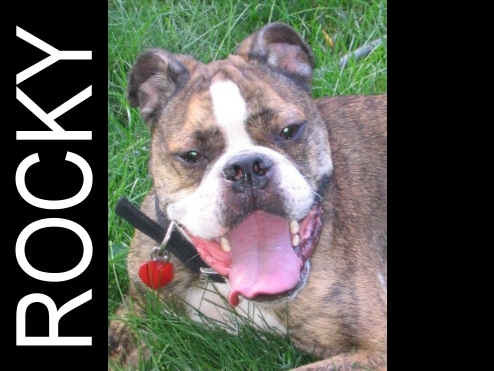 Rocky is neutered, up to date on shots and gets along very well with other dogs! PLEASE HAVE AN APPLICATION TO ADOPT ON FILE BEFORE CONTACTING US! We only adopt within a 1 hour radius of St. Louis MO. Adoption fee, home check, reference check, and vet check apply.